Pop Rocks & Basil Ice Cream? Beware the GroupThink! Don’t let fear or consensus-building waterdown your best ideas. We all like agreement. It feels nice when a group of people are all aligned and everyone has the chance to contribute. It is a warm, hugging, campfire-song kind of feeling. It can also kill your creative potency. Now if you stopped right there, you could have something fantastic. This could be an interesting, different, remarkable flavor. Some people may love it, some may hate it, but it would be unique and compelling and new. Unfortunately, business brainstorm sessions rarely stop there. “I love milk chocolate,” another colleague chimes in. “Let’s add peanuts too”, says another. “We need Pop Rocks in there. I had it once at a specialty shop and it was super fun,” says Fred from Marketing. “We definitely need chunks of fudge”, Pam from Operations adds. As you go around the table, everyone adds their own thoughts and opinions. This is great, and the more ideas the better. The problem, however, comes when it’s time to distill the ideas down into a final product. Too often, weak leaders take every idea and mush them together in an effort to pacify the team and create “buy-in”. As a result, what started as a powerful idea can end up watered down dramatically (or in this case, junked up). GroupThink can also crush ideas in reverse. Ben & Jerry could have been easily convinced by their team that each new flavor was too radical, or that one ingredient or another creates too much risk. Or that some focus group or previous experience or spreadsheet indicates that the idea should be softened. 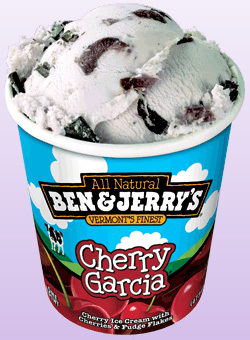 How many times at your company have you seen a great idea (the business equivalent of Cherry Garcia) get over-analyzed and end up as pure vanilla? Consensus-building can dilute the potency of an idea, and drag what should be something remarkable into yet another me-too plan. Trying to please everyone can be a dangerous trap, draining the poignancy out of your best ideas. Instead of watered down, GroupThink, bland-idea soup, let your imagination soar and dare to be bold. Why launch a new product, service, process, or idea in the first place unless it is a powerful and original effort? This week, try letting everyone’s ideas come out freely but then make sure that what you launch is something that can generate a “wow”. Powerful. Special. Unique. Bold. Daring. Remarkable. Different. P.S. Check out Jeni’s Ice Cream. This savvy entrepreneur offers amazing flavors such as Thai Chili, Wildberry Lavender, Creamery Goat Cheese with Cognac Figs, and Queen City Cayenne. No watered-down sameness here. Just brilliant creativity … and a booming business to show for it!